First, we boarded a train for New York City. Because it was there, in The Big Apple*, that Fox and I discovered each other! People, there is nothing more romantic than good cheese and quality Dutch ovens. On Saturday night, we dined at Boulud Sud on West 64th Street. 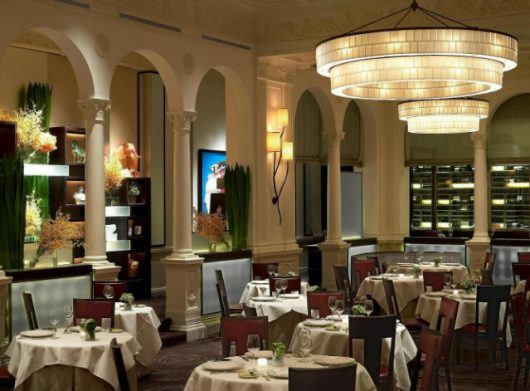 The restaurant is named for its owner, chef Daniel Boulud. It’s a pleasant place with great food and excellent service. Our only complaint? The room was too large and too brightly lit for a “romantical” event. While Fox sipped Prosecco, I tucked into one of Boulud’s signature cocktails: Bombay gin with lavender and honeycomb. I’ll have to reproduce deliciousness at home, and share the recipe with you. 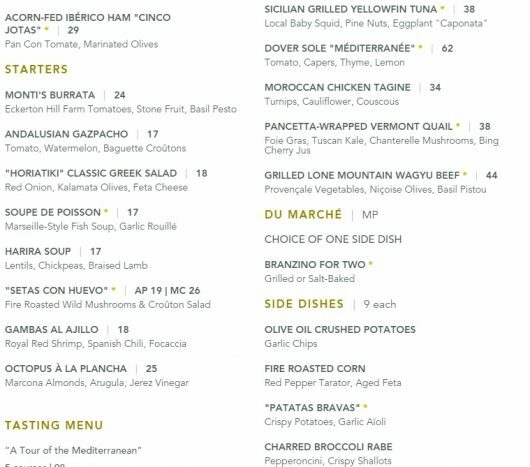 Here’s a detail from Boulud’s menu. We started with a generous assortment of Mediterranean breads and spreads, and then moved on to Andalusian Gazpacho and Pancetta-Wrapped Quail. This last dish was as wonderful as anything. Although we did not order dessert, Boulud delivered one anyway. How could we refuse? 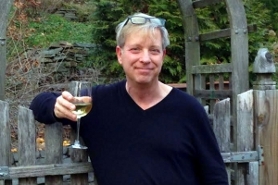 On Sunday — our actual anniversary day — we walked to the corner of 60th Street and 3rd Avenue. It was here, on July 29, 1998, at a bustling cafe, that Mr. Fox and I had our first date. The place was called “Butterfingers” then. 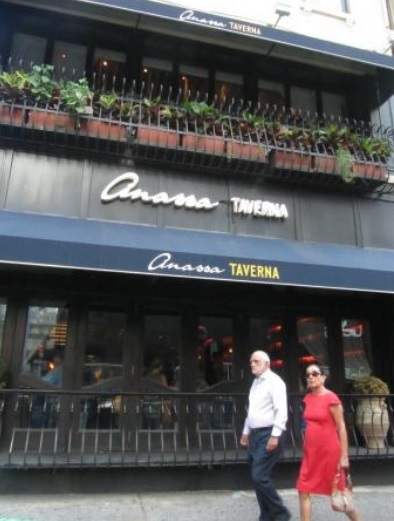 Now it’s a Greek eatery called “Anassa Taverna.” We did not stop to eat there, but vowed to do so on our next anniversary. 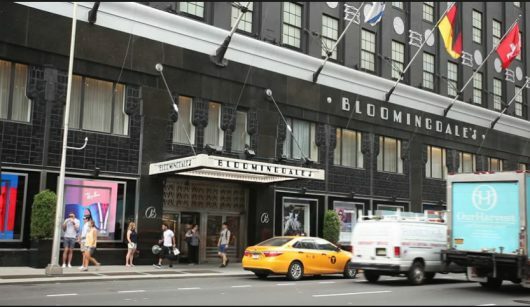 Then we popped into Bloomingdale’s, where one of us was promptly doused with “Dylan’s Blue” — the latest men’s fragrance from Versace. I enjoyed the scent, so Mr. Fox surprised me by purchasing a bottle. Next, while the scent of Dylan’s Blue still lingered in the air, we headed south to Gramercy Tavern for lunch. And what a leisurely lunch it was! 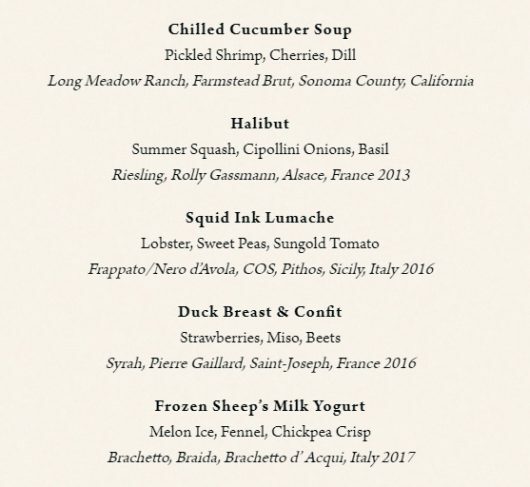 For the next two hours, we sampled the Gramercy Tavern’s Seasonal Tasting Menu (described above). 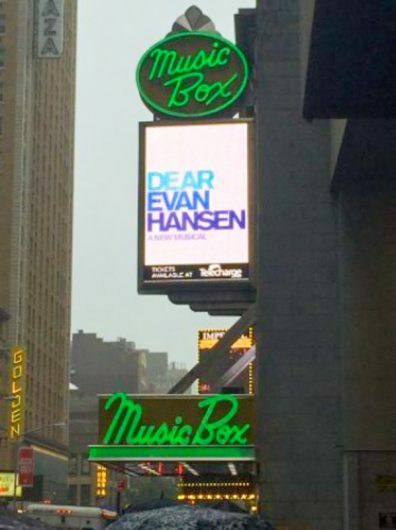 After lunch, we raced to the Music Box Theatre for a performance of “Dear Evan Hansen.” If you haven’t yet seen this engaging and emotional musical, you must. The story centers on Evan Hansen, a high school senior with a social anxiety disorder. He finds himself in a “bit of a mess” after the death of a classmate. Fox and I had tears in our eyes for much of the show. I’m not sorry that we did not travel to Ireland for our anniversary, as we’d originally planned. Manhattan, for us, is a short (2 hours and 10 minutes) train ride away. Consequently the trip was all fun and no jet lag! The ability to forgive and forget? Speak your mind in the comments field below. Congratulations! Looks like a good time in NYC…. I think your secret is your sense of humor…who could NOT want to spend more time with you? Congratulations! August 9th will be our 34th wedding anniversary. We also dated for three years before getting married. We started dating when we were 15 and 16 years old. My husband graduated high school earlier than I did. He joined the service and ended up overseas. We wrote letters almost daily. When I left high school, he sent me an airline ticket and I flew to meet him and get married. We had not seen each other in over a year. This was at a time before computers and cell phones. We poured our souls out into our letters. We were and still are best friends. We know the best and the worst of each other. Life is not perfect and no relationship is perfect. Accept the hard times that are necessary to appreciate the good times. When he gives me a certain look or smile, that is meant for only me, he still gives me butterflies in my stomach. We are a mutual admiration society of two. 49 years on August 30 for us! Much congratulations to you both! You MUST go to Ireland though! Don’t know what the secret is, but thank you for sharing your anniversary with us. So glad you have each other to love! As for your question…..all of the above! The secret, which unfortunately my ex failed miserably at, is to always be honest. Congratulations! September 8 for us 57 years -!! We still love spending time together- forgiveness, honesty, love and allowing each a little space!! Congratulations! I’m very happy for both of you. Sorry, I don’t have any secrets for longevity that I can offer, but I like yours! Wow, so many of your readers have impressively long marriages! I feel like a comparative newbie coming up on 16 years! As such, I don’t have any wisdom except to say that *kindness* is so important – I married an incredibly kind man – he’s the type of person who sees the best in other people. We really try to treat each other with gentleness and respect. What a fabulous way to celebrate! Happy Anniversary. 31 years for me! My husband was in the Navy when we met, and after meeting three months later was transferred all the way across the country. We said goodbye, thinking that was it but missed each other, started writing and like Candy wrote above. we relied on the postman to keep us in communication. He will always be my best friend. I think our marriage has survived because we have always put each other first. 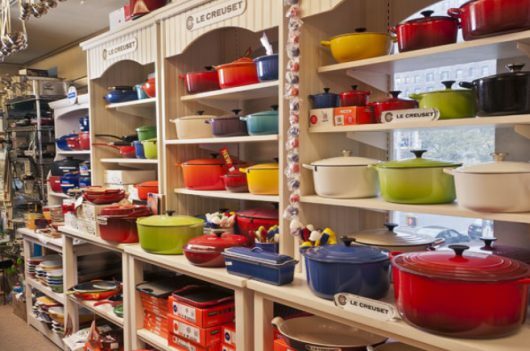 I’ve never been to New York City, perhaps someday, and my first stop will be Zabar’s housewares dept, lol. 21 years married as of this week, 28 together. I think a sense of humor has kept us going. We have spent 19 years on opposite schedules as he’s a nightshift Ford line worker. It has taken lots of sacrifices, years of struggling, & hard times. But being able to laugh together, support one another, & laugh through it all has kept us closer than ever. Congrats to you both! Secret to success…… acknowledge your partners strengths, and remember to cherish them when you are in despair over a weakness. Show love in actions, i.e. 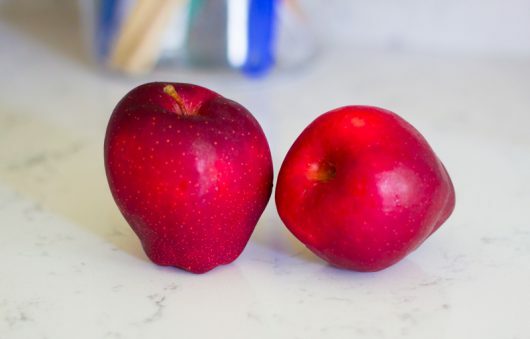 linger on the porch with coffee, make that special breakfast, tell him he is the apple of your eye. Before long, the years go by and the two of you are still holding hands at the theater. Congratulations. What a lovely trip! Congratulations to you both. We were hoping to get to NYC to see Boys in the Band, but the kitchen Reno got out of control. The secret is enjoying the passage of time, together. LOVED the vid of the pooches playing on the stairs! Too adorable. You just keep coming home… speaking from 47 years. Sometimes it’s good and sometimes it’s better. But when you come home, you are present to the other and that makes it worthwhile. The Hubby and I just celebrated 30 years together. Our rules are really quite simple. An argument can last only 30 minutes. If you can’t make your point after 30 minutes then you need to rethink the issue. Always say your sorry if you are wrong and especially if you have hurt the other, even if it is by accident. It won’t kill you to say I was wrong either if you are. Holding grudges isn’t healthy nor will it make your point And last but not least never go to bed mad but always say I love you. Happy Anniversary a little belated. I was visiting my old stomping grounds this past week too. We ditched the kids and spent a lovely day at the Warhol Museum and doing all of the things kids find “too boring. In fact at the Warhol I heard a young child say to his parents , “when are we going to do something fun?” and I was so immensely grateful that we had left ours with family and could enjoy the day at our leisure. May the best of health and happiness be yours and Mr Fox for next twenty years and beyond. My husband and I just celebrated our twentieth as well. Love just keeps getting stronger and deeper. Hugs to you! Happy anniversary!! What a lovely celebration. Many congratulations to you and Mr. Fox! And thank you for sharing your anniversary celebrations with us. You’ve given me many good suggestions for a trip to NYC! My husband and I just celebrated our 50th anniversary, and I still couldn’t say what the secret is – except to love each other, which we do now, more than ever. 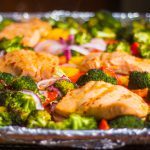 Thanks for your blog – I always enjoy your news and recipes and ideas! Making each other a priority and laughing together, even when annoyed seems to work for us-20 in January. Congratulations. Please keep writing. And stay ‘romantical’ as long as you can. Love Anne with an E too! Except for the one with the dishonest ex-, it’s nice to hear so many lovely relationship tributes. I always say “third time’s a charm” as I’m in my third, best marriage. Simple kindness goes a long way. Congratulations to the two of you. all of your comments and more are the secret to a lasting relationship: respect, communication, love and caring, and realizing that a relationship is not always 50-50%–sometimes it shifts and that’s OK.
“Romantical” hmm I remember hearing that from the “Little Rascals”. Loved reading all the other comments and relationship stories. Maybe a bitter sweet story but we both learned what we deo and do not want in a relationship. Sometimes ya gotta go through hell to get to heaven. David & I fell in love in 1973 when we were 10 years old! Our marriage success story is unconditional love, personal and Team accountability and always making time to play! Celebrate Love, it’s the key to the kingdom!! I believe Anne of Green Gables is responsible for “Romantical”. Happy Anniversary and many more romantical years together! Congratulations to you and the Fox! Loved your description of your celebration in NYC. We are going on 53 years of wedded bliss. Another must for a long and happy marriage: Laughing at one another as well as laughing with one another. I think the secret is willingness to listen with an open mind and heart, working through differences in dialogue, differences that are bound to arise if you are giving each other the freedom to keep growing. I had 20 happy years with my husband before he died. Pop quiz: I’m hearing “romantical” a lot from Anne with an E on Netflix. And I forgot to say, Happy Anniversary, and thank you for sharing your mutual creative lives with us! We are celebrating 39 years on August 11. The secrets, tell each other how you feel, never go to bed mad and laugh a lot. Congratulations and many more happy years together! Congratulations on sharing life and love for 20 years! Marriage is a journey where you not only learn much about another person, but as time goes by, you begin to really see yourself for who you are. You must give and take, respect and love , support and encourage and give space to the other. As time goes by, a special love develops that fills your heart and remains there till the end. I believe Miss Chi-Chi Rodriguez is the expert on “romantical” things. Happy anniversary to you both ! Glad you had a lovely trip. Congratulations. It sounds like it was a well-planned weekend. Keep Ireland as your “next time” trip. We have been there twice. Lovely people, scenery, food, and history. Take it in the spring when everything is so alive. In my humble opinion, a marriage that lasts is not the same as a successful one. These days life in general is typically labile and that can make long term relationships challenging. If you happen to love a person you’ll remain compatible with over many years, wherever your individual paths take you, well then, your love and your marriage could last many years. So, perhaps the ‘secret’ is to allow each other enough space and support to grow as a person, and value your marriage enough to compromise. 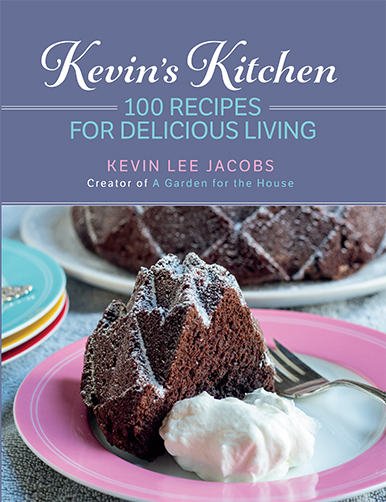 I do however know that even though I’d years ago sworn off ever buying another cookbook, and stuck with the day decision, I broke my rule to buy your’s from BookBaby. It has just arrived. I LOVE it, and am so very glad I bought it. It’s just perfect. The photography is spectacular. The layout makes it enjoyable to read. From following your blog I already knew I loved your recipes. You manage to keep it simple without compromising an attitude of fun-elegance or quality. Love, laughter and total respect for each other is a recipe for a happy marriage..Congratulations on 20 years. Let’s have a Bombay gin with lavender and honeycomb to the next 20 …. Happy anniversary Kevin. Looking back on 43 yrs of marriage I have tried to find the answer. Dating 4 yrs certainly helped us find the good and bad in each other. Putting the other first, never name call in an argument, and communication, communication, communication. And trust. Without trust you have nothing. Keep up the great blogs Kevin! Fifty-five years in March. Enduring friendship, mutual respect…we were friends before we became lovers, not merely acquaintances. We were young, twenty and twenty-one. Our families were against us, said we would drop out of college, get tired of one another’s foibles, interests. They were wrong, none of that happened. Everything that was there at the beginning has grown, blossomed, enriched with devotion and respect, through trial and error, mistakes we each made. Over bumps along the way ( there were many bumps), we always took our commitment to seeing things through together as serious, sacred. Congratulations to you two. Your foundation must be solid! You have so many more wonderful years ahead, highlighted with memorable anniversaries. Be grateful for each other every day, and do the thing you are very good at: ENJOY! You don’t need anybody to tell you the secret to a long lasting relationship. You have your own recipe. For my husband of 45 years and I is the love that has endured through thick and thin with all the history that has been built throughout the time. As years go by your partner is the only one that has shared in all the secrets of your heart. Good and bad. The one that has seen the best and the worst of you and that has shouldered some of the most terrible times or your life and shared some of the happiest moments. Respect the differences, enjoy the things in common has worked for us. And it helps if once in a while you celebrate each other the way you just did. Congratulations and cheers to you two!!! May you enjoy another 20 years of married bliss. Congratulations Kevin & Mr. Fox! Regarding relationships, I believe that mutual respect just about covers everything. Everything else will fall into place. What a delightful celebration in New York. Thank you for sharing the photos – took me back. I will revisit your little tour later today to really read all the details – you know, like the menus. My trips to New York have always been memorable – due for another ‘fix’. Your comment, “Our only complaint? 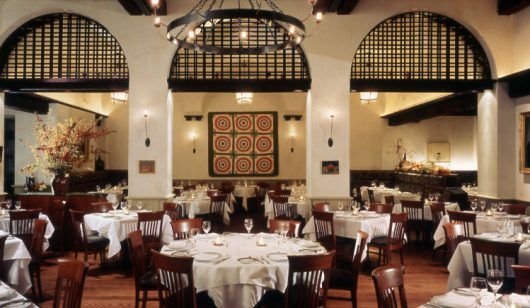 The room was too large and too brightly lit for a “romantical” event.” Many restaurants seem to miss that in their planning. It isn’t simply about being ‘romantical’, it simply lacks ambience, often too noisy, conversation and privacy are difficult. Many congratulations to you two kids. For my husband and I we’re celebrating our 44th anniversary. I think the recipe to success for us is that the fundamentals are the same. Those being: honesty, family, a work ethic, respect and a HUGE love of travel. Your New York trip looks fabulous. Thanks for brightening my inbox every week with your wonderful recipes et al. We just celebrated our 53d anniversary. I say celebrated even tho I am many states away helping my sister who just got out of rehab! Patience, tolerance, and faith in God goes a long way in an enduring relationship. So does enjoying each others company & spending time together! Congratulations and many more years together! Congratulations to you two! Sounded like a perfect Anniversary Getaway! My hubs and I have been married for almost 34 years. My grandfather who married us gave the wise old advise “don’t consider divorce an option, work it out and never give up”! So far so good! But all your suggestions including roasted chicken in Sundays are great advise too! Love your blog! Happy Anniversary! Looks like a very enjoyable way to celebrate. Best wishes for lots more celebrations in your future. I so enjoyed your anniversary post as well as all the responses. The secret, which I failed miserably at with both my ex-es, is to not blame everything on your spouse. Congratulations. What fun you two had and because you are always thinking of us, we thank you for including us….. I had a wonderful time. Congratulations on your 20 years together. We are 48 years and counting…. how did we do it? Working as a team helps, find mutual interests, keep a beautiful, calm home – are some things that come to mind. You must go to Kinsale, Ireland – the gourmet capital of Ireland. We recently spent 5 weeks in Ireland, 3 weeks were in Kinsale, 1 week at Ballymaloe House so I could attend their Cookery School, and the last week was spent just touring around and staying at B&Bs along the way. We went to Ireland for the first time about 25 years ago to take our daughter as a graduation gift. We went on a tour that time, but this trip of 5 weeks was so rewarding. The food is fabulous!! All of the above! So happy you had a wonderful anniversary. Like Jeri above, my husband Don and I will celebrate 49 years on August 30. We married at 21 and 19 years of age, respectively, and everyone thought we were too young and would never last. Those opinions made us determined to prove them wrong, so we basically grew up together in our twenties, through college and babies and whatever else life threw at us. I love him with all my heart, and we always have each other’s backs, no matter what. And now, at the ages of 70 and 69, we have just adopted a 7-year-old daughter, so it’s a whole new adventure! Can you stand one more Congratulations? After 42 years of marriage myself I don’t know what the secret is? All I know is that when I think back on our relationship , it’s not the great romantic moments that we’ve had together that has held us but the mountains we’ve had to traverse together that glued us, plus a good dose of humour helps. Hi Kevin and Mr. Fox – what a wonderful way to celebrate 20 years together. We are on #56 and still going strong. I agree with others that Ireland has to be in your plans for the future. Add in Paris, our favorite city, with the wonderful baguettes and pastries and you will have a fantastic time as well. Congrats to you both and wishing you many more happy years together. Happy anniversary & many, many more! Congratulations. Happy Anniversary and many more. Now about that romantical: You have me stumped!!!! Congratulations on your 20 years!! I’ve been married for 41 years on July 16th, and I agree with the others who have said that mutual respect is the most important thing. Also, don’t sweat the small stuff. There’s too many important things in life so don’t worry about the little things that bother you – just let them go. Enduring.. anyone can do that.. for so long.. but in my mind heart.. you did not endure but instead you blossomed.. you both grew and thrived and became so much more than the wee seed of a life before.. you developed such deliciousness from being together, as if you were chocolate and Chambord intertwined ; Garlic and Thyme, Back rubs and facials.. you found in each other hidden Joy’s like rummaging a diamond in the rough desk– and there in a wee drawer was gold, all for you.. each day was a new delight no longer hidden but revealed only for your hearts to perceive it’s new found bountys. Each night, slumbers no longer alone or anxious but cuddled, giggling, soothing and loving. Nights that cradled your souls to sleep, relaxed, content, safe. Lifes experiences to share, a moment a movie a tear.. there is nothing do precious as someone who shares in love. You found this in each other. This is rare. Make no mistake, we know the world for what it is.. cold, cruel and of times selfish. You too found a sanctuary in each others world, in each others arms. Rescued from all thwas was unloving, now within basking in sunshine on rainy days because, he smiled st you.. you know that smile, that quick twinkle in his eyes.. and you bloomed. Happy Anniversary and many, many more! I think the secret of a long relationship (we’ve been married almost 42 years) is giving each other space – space to be who each one is, to grow as individuals, and to pursue one’s own life goals. That way, there’s always something interesting to bring back home! Works for us anyway. Oh – and ESSENTIAL – a keen sense of humor! P.S. I think the secret is a high goofball quotient … life is too short, and filled with challenges, and whimsy is so healing! I really enjoyed this post. Congratulations to you both! Happy anniversary, you guys. It’s wonderful to see you sharing so much fun (and housewares) together. Many more happy years together! Kevin and Mr. Fox my sincere congradulations on your anniversary. My thoughts after 49 years of marriage are: 1] love and respect one another and respect each of your privacies; 2) trust one anther; 3) Grow individually and ultimately together; 3) stop and smell the roses, as we all get caught up in our own lives; 4) Laugh, laugh and laugh a lot; 5) Remember why the two of you fell in love. God bless you both. Being kind and a sense of humor go a long way. Will you do a post of how you and Mr . Fox meet? May not be so deep and philosophical but, my husband and I always, put a smile on our faces whenever we saw one another. You both MUST have the ability to be yourselves and to appreciate your differences. Not an easy task but doable when Love is the catalyst. Congrats. Not a secret but knowing when to close your mouth before a mean and hurtful word pops out. I often fail, but I keep trying. Romantical is from Anne of Green Gables. Happy Anniversary to you two! Keep living together in health and happiness. That’s the toast to 26 years of marriage, for my husband and I.
Laughter …when appropriate, of course. But laughter! What would I know about romance? Been divorced for years. Boulud sounds amazing though. Is it Spanish or a basque? That’s my kind of food. I love broccoli rabe too. The chicken with turnips and couscous would be my choice. At Grammercy, I’m digging the chilled cucumber soup. I make that all the time with fresh dill but tomorrow I’m going to add cherries! Unsure of pickled shrimp. Did you try it? I am touched by your celebration of your love. Sharing brings closeness. In a relationship, I love it when someone really “hears” me. And for me a relationship isn’t a relationship until there is laughter. Happy Anniversary to you both. I’m happy for you both and it sounds like you had a wonderful holiday. I wish you many, many more years of happiness. I do agree with everyone’s posts and would like to add one thing. I always told my children these very same things before they married, but added there is No room in any relationship for jealousy. So put it away and never look at it again. We will be married 34 years on October 6th and thru good times and bad. We Love and enjoy each others company everyday. I find discreetly rolling your eyes behind each others backs is an exercise that helps to keep things stress free when needed. Also, having compassion for any roadblocks your spouse endured when growing up keeps a loving equilibrium and respect alive. Having a bit of space to grow and to remember who you are and what is important to you is a godsend. Mr Fox having a small apt in NYC where he can spend the occasional night gives you some space and makes the time together more meaningful and special. 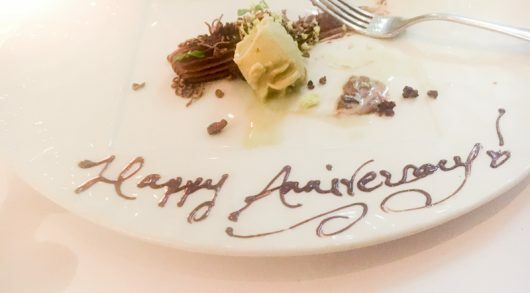 Glad your anniversary was so special! 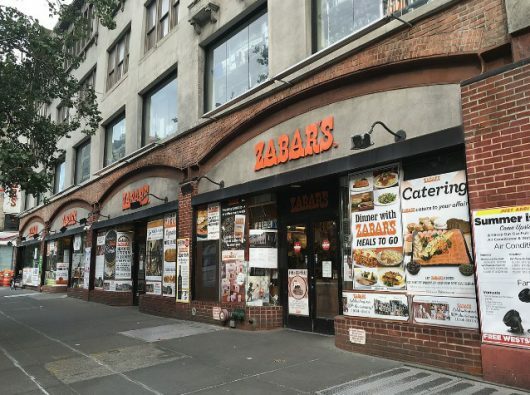 Zabars was always the first stop when we hit NYC. 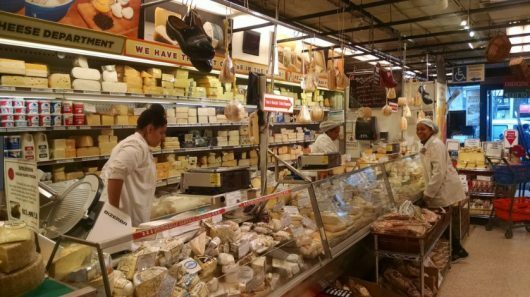 Their bread and cheeses…….. what else can one need except maybe a great bottle of wine! I meant “Anne with an E”the series based on Anne of Green Gables, streamed on Netflix. Congratulations on your anniversary. 20 years is a great milestone. My husband and will celebrate 44 on Oct 5. I agree that honesty and truthfulness are 2 of the most important contributions to long relationships. I also think that being able to handle the really hard stuff like losing a parent,losing your job , life stuff with compassion and just being there for each other helps. Hubby and I just celebrated our 36th year together. What keeps us together (in my opinion) is that he still makes me laugh! He’s also my best friend! We hope to make it to Ireland together one day! Congrats on your 20th! It only gets better!! “To Wong Foo “? One of my VERY favorites! Happy Anniversary! Hi Pam — Bingo! You are the winner of the Pop Quiz question. Since I am Irish, I’m disappointed I’m not hearing stories from Ireland. Do go some day, I guarantee you will love it there and the food. Try Kerrygold Irish butter. It’s the best. Congratulations to you Kevin and Mr. Fox on your 20th anniversary. Your weekend trip to New York City sounds perfect! We will be celebrating our 48th in September. Happy 20th Anniversary! I have found that great relationships are those that learn to keep growing and learning new things (It can be cooking, gardening, traveling, making music or art, exercising etc…), also laughter everyday is good for all souls! 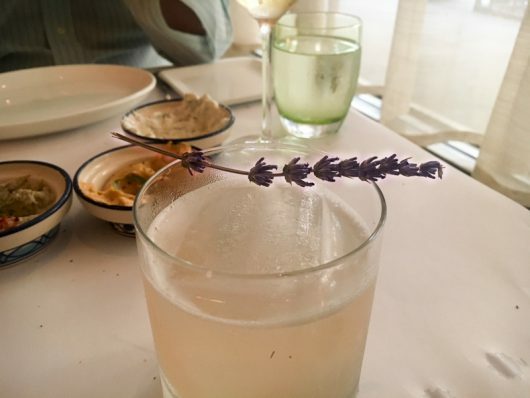 Please show us how to make the Bombay Gin with lavender and honeycomb…– just writing it makes my mouth water. Sounds as though your celebration was a total success and only the beginning of the next 20 years! Congratulations and much joy to you both! I love Trains too, Kevin , Trains are so much more fun then planes. We took the sleeper car to Boston once and it was so much FUN !!!! It sounds like you had a wonderful time with Mr. Fox . I might mention that Foxes are my favorite animals , so sly , intelligent and beautiful…. Congrats & heres to many more lovely anniversaries . Congratulations to you both. Kevin and Mr. Fox. How wonderful! You have found the recipe for sure. Love, a lot of fun and laughter and mutual respect. Thats it. Many many happy returns to you! Thank you for sharing it with us! How generous. Sincerely, Noreen. Married and happy to be for 40 years.